Saturday June 2, 2018: I woke up at 6:30 am with the sun already rising. I'd rolled over every hour or so during the cold night, did some sit-ups in my sleeping bag to generate heat, and then dozed off again. Late into the night, I finally managed to string together more than one hour of uninterrupted sleep. I was still plenty chilly, so my first order of business was hot tea and hot oatmeal. I am pleased to report that my bear-proof Ursack hadn't been disturbed during the night. I suspect it was mainly because the bears were all hiding in caves to escape the cold. I made the oatmeal in last night's Chili Mac freeze-dried food bag, a convenience that kept me from getting a cooking pot dirty, and instead made the oatmeal bright red and slightly spicy. Delightful. Before leaving, I took advantage of the fact that I was staying in a State Forest campground one more time to throw away my trash in a real honest-to-goodness trash bin. What wild luxury! With that, I headed west out of the Lake Superior State Forest campground, following the blue blazes of the North Country Trail. The trail was beautiful, in a different way from yesterday's trail. Yesterday, I was always in the forest, hiding under the trees despite being just feet from the shoreline. Here, I ran through open fields of beach grass with occasional pines or scrubby trees. The early morning light lent a golden glow to every scene. The trail near the campground stayed close to the lake, but again unlike yesterday, it ran over extremely bumpy territory -- a constant series of ups and downs. For the first -- but far from the last -- time today, I noticed that the trail seemed to go directly over every hill in its way, never veering around anything. This all changed as the trail climbed one last hill and then leveled out, high above the lake. And just like yesterday, the trail started falling off the cliff. The pine forest was open enough that I just followed the bluff's edge most of the time, not worrying about the trail. The sheer number of blowdowns, however, occasionally required me to do some serious inland bushwhacking. I knew that somewhere within a mile or two of the campground, the trail turned sharply inland and stayed that way. To make sure I didn't miss the turn, every now and then I would pop out to the edge of the bluff and scan the line of fallen trees far below until I saw one with a blue blaze -- just to make sure I was keeping on track, you see. I did eventually meet a wide, clear trail heading inland to my left -- so wide it was almost a 2-track. The NCT seemed to dead-end here, with a thick wall of brush blocking me across the 2-track. I must have to go left down the 2-track, I figured. Sure enough, on a tree next to the turn, there was a pair of bright blue blazes telling me to turn... right? I looked to the right, and just feet away I saw the edge of the horribly eroded bluff and the blue lake beyond it. The 2-track sailed right off of the bluff, the rest of it fallen far below. These blazes mean "turn right". Note the trail going left. I scratched my head. Could someone have mis-blazed the trail and meant to leave the similar -- but definitely not identical -- blaze that means to turn left? I peered down the 2-track but couldn't see any blue blazes on the trees that way. Maybe I really was supposed to go right. I thought about this option quite carefully, because the only thing I wanted to do less than getting lost in a maze of 2-tracks in the UP backcountry was getting lost off-trail in a trackless wilderness in the UP backcountry. Looking really really carefully, I found another pair of very faded blazes on a pine that was just barely clinging to the bluff's edge. Sure enough, the trail did turn right -- and then almost immediately left again. The trail beyond that point had clearly fallen off of the bluff, so I had nothing left to do but bushwhack it again. For a nerve-wrackingly long time, I didn't see another blaze, and the trail's tread was nowhere to be seen. I kept peering over the edge for fallen trees with blue blazes, but I couldn't see a single one. 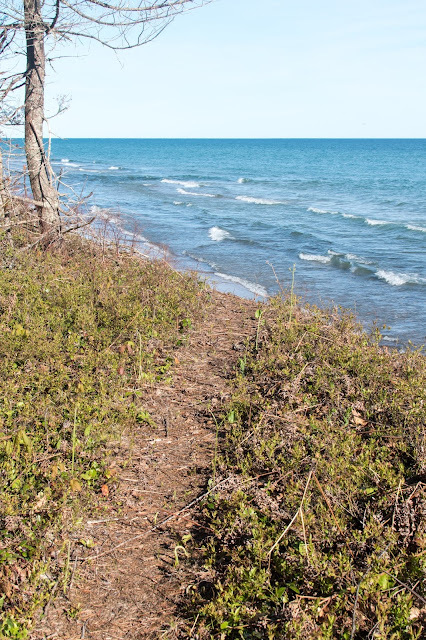 At very long last, the trail reappeared from the edge of the bluff, and a blue blaze told me that I'd made the right choice. Almost immediately, the "turn left now!" blaze showed up, and the trail cut south through dunes, ridges, and swales. In just a few minutes, the trail crossed a large and well-maintained gravel road. This was the Grand Marais Truck Trail, the same road that I'd been dropped off at outside Muskallonge State Park yesterday, and which ran next to the campground that I'd stayed at last night. My plan for today was flexible. 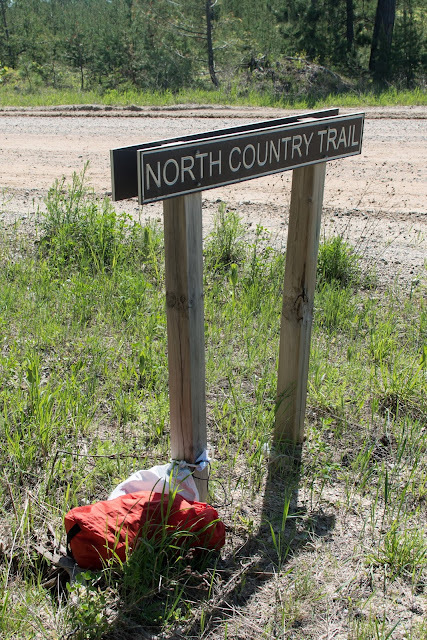 The North Country Trail crosses the Grand Marais Truck Trail multiple times, and each of those was a potential ditch point. Just a few miles from my camp, I definitely wasn't ready to stop yet -- so, 5 more miles for me. Crossing the road, the forest changed yet again. The trail wound through an open pine forest and skirted the edge of a strange, open, burned-over land. Perhaps it had been logged, and the slash piles burned -- I didn't know. Under the forest, the hillsides were more open, and the ground was covered densely with pale blue-grey moss and pine needles. I wound around scrawny pines, in and out of the cool morning sunlight, and up and down hills. 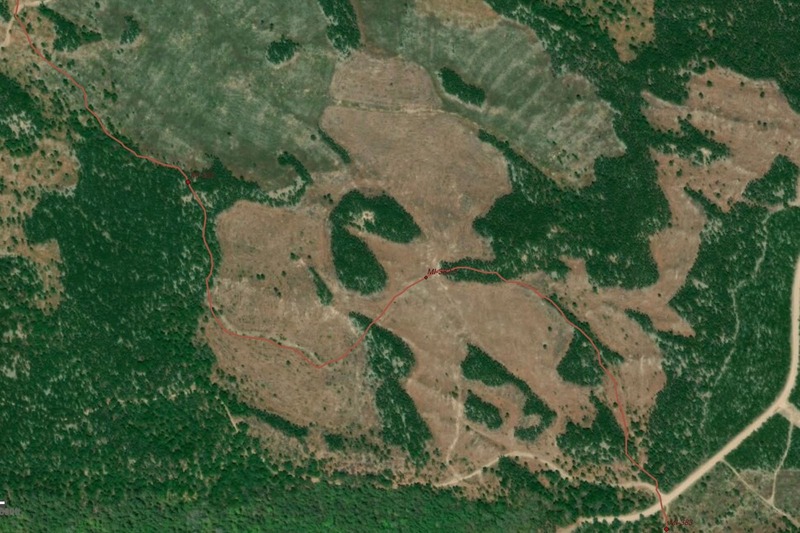 The trail skirted around another large logged-out area. In this segment, the trail joined the "Blind Sucker Pathway", a loop probably intended to take hunters along the Blind and Dead Sucker rivers and between various campgrounds in the area. The trail continued its trend of heading directly up every hill in its way, including one extra-long huff-and-puff up a very large ridge. At the top was a picnic table overlooking the beautiful and steep-sided valley of the Dead Sucker river (yes, there's the Blind Sucker, the Dead Sucker, and just plain the Sucker -- all of which I met on this trip). I sat here for a while, eating gorp, relaxing in the shade, enjoying the views, and reading the obscenities carved over top of each other in the picnic table. There was a fallen sign pointing the separate ways of the Blind Sucker Pathway and North Country Trails, which split here. I knew the right directions, so I attempted to re-set the sign in the correct orientation. When that didn't work, I just laid it down in a way that at least wasn't wrong. 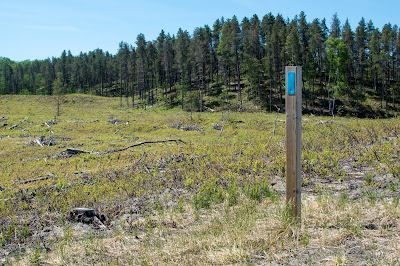 The North Country Trail turned sharply west and followed along the edge of the ridge on an old 2-track that was quickly becoming overgrown with low blueberry bushes. The trail wound over hills and around the edges of lovely hidden lakes. The largest of these, and almost wholly hidden from the trail, was Props Lake, about 3 miles later. As I skirted high above its (barely glimpsed) deep blue waters, I scared up something very large and very loud. I tried mightily to get a glimpse of the creature, but I couldn't see anything as it noisily splashed through the lake's shallows. Nonetheless, I'd heard those sounds before on Isle Royale -- it had to be a moose! A mile later -- 7 miles total for the day -- I crossed my old friend, the Grand Marais Truck Trail again. I sat on a log just inside the shade of the forest, ate a lunch of rice cakes with peanut butter, and pondered. This was the 2nd of my possible ditch points. It was only 11 am, our scheduled meet-up was 4 pm, and I was feeling great. Lunch gave me a shot of energy, and I was ready to keep moving. The only trouble was that the next segment of the NCT was 6 miles long without any chance to ditch. After already doing as many miles as I'd do in a normal backpacking day, I considered the wisdom of nearly doubling that amount. I wanted to continue on, but the backpack was starting to weigh heavily on my shoulders. I came up with a plan: I removed non-essentials from my pack (tent, clothes, a handful of other heavy items) and crammed them into stuff sacks. I then tied those sacks to the base of the large North Country Trail sign at the road crossing, and left a note explaining that these were mine, thankyouverymuch, and that I was planning to come back and retrieve them later. I kept only absolute essentials -- a little food and water, matches, a space blanket, and similar items in case something went wrong. With one last check of the bags, I hitched up my much lighter backpack and headed out with a lighter step. The stand of pines in which I'd eaten my lunch turned out to be just a few dozen yards deep. 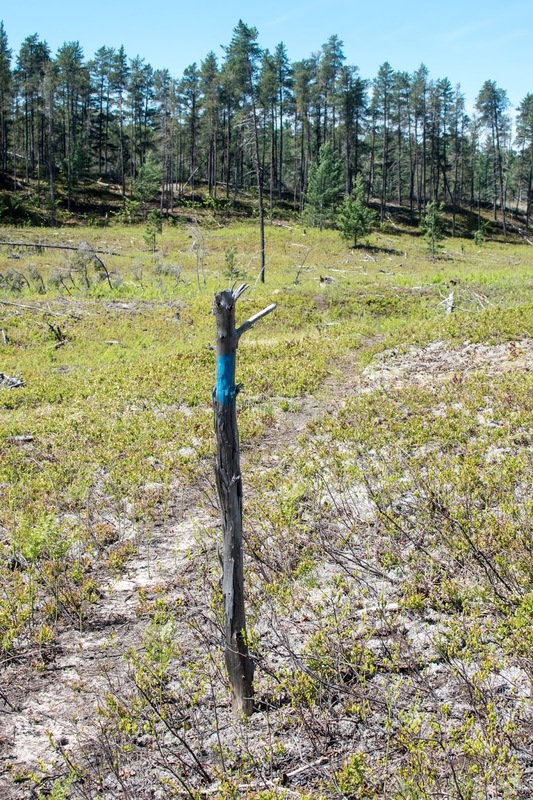 This is a common trick of logging companies in the UP: It looks better if they don't log all the way to the road. Shortly after starting, I stepped out of the cool pines and into a barren and sun-soaked field of slash. These pines had been logged within the last year or two at most. The trail was visible as an area of bare, packed dirt among the slash and low blueberry bushes that covered the sun-drenched ground. Every now and then a tree remained standing, and -- surprise! -- they were exactly the trees with blue blazes on them. I'm not sure who made arrangements with the loggers, but the trail remained blazed, even amidst the nearly total removal of the forest. The trail marches through oddly logged areas. You can also see my road crossing near the bottom right, and recently re-planted areas in pale green towards the top. Some of the lonely blazed trees had fallen over, at least in part because they lacked support from their brethren. Of course, when this happened, they fell directly across the trail. Sometimes, even the trees hadn't been saved, and the only blaze around was on a wooden post. Other times, the only blaze in sight was painted on a stick jammed into the ground. After a long, hot, and sunny few miles walking through these miserable and sad lands, the trail finally re-entered a mature pine forest. The understory was open and filled with blueberry bushes, just starting to blossom. One side of the trail was the edge of a previously logged-out area that had been replanted -- or maybe naturally re-seeded -- and was densely packed with head-high pines. I enjoyed this leg of the trip, with dappled sunlight and a perfect temperature. I passed several survey markers and stopped to take a photo of them, knowing that my surveyor-in-laws would be curious to see where I'd been. 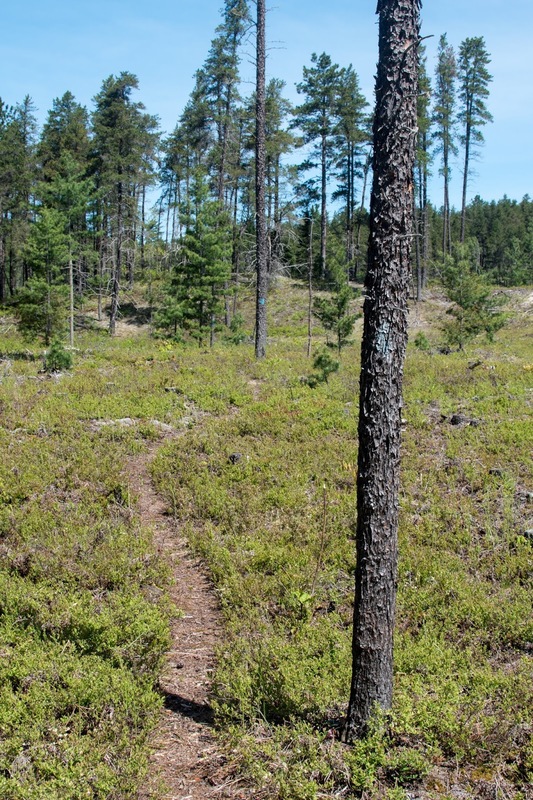 The trail aimed generally north, occasionally crossing narrow 2-tracks that appeared to be well-used by locals, but were not wide enough for logging trucks. 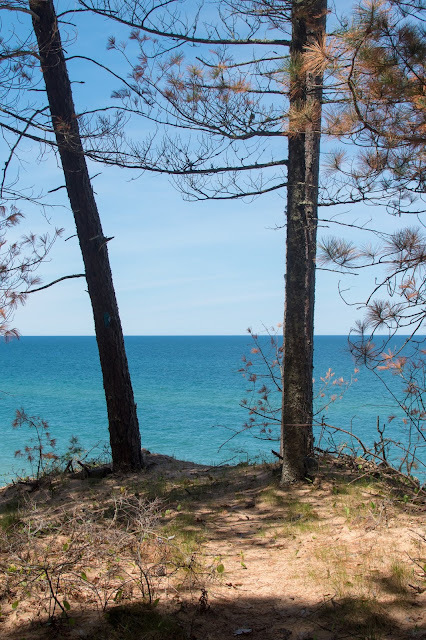 Soon, the ground became sandier, the trail headed up a hill directly into a perfect blue sky, and I popped out on another gorgeous Lake Superior beach. The lake was a perfect deep blue-green. The sky was clear. The breeze was light. I sat down, ate some gorp, and drank it in. Everything about the scene was perfect. There was one jarring element that seemed out of tune with the rest of this beauty: This beach had suffered from the same storm that tormented my earlier trails. It was strewn with driftwood, and even some of the standing trees on the shoreline were clearly dead. With my rest break over, I got up and followed the trail as it made a sharp left, heading west to follow the shore. 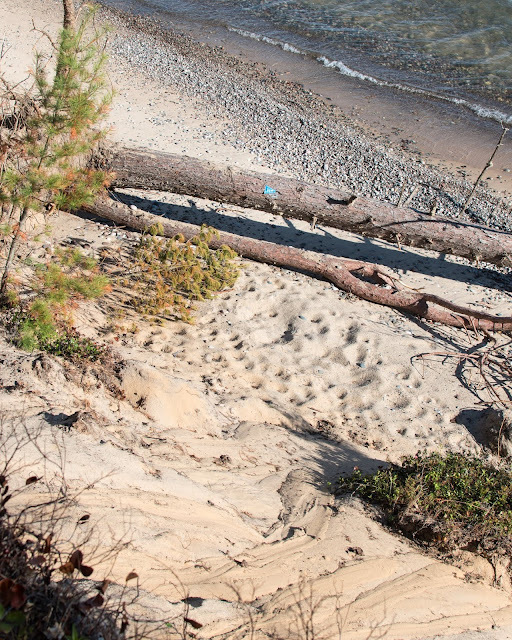 The trail followed a sandy 2-track through the (mostly) dead pines. As with the day's other 2-tracks, these looked like they were used by locals to access the lake. Indeed, while I felt like I was absolutely isolated and alone, I suddenly glimpsed a tent set up in the stand of pines next to the lake. A little while on, I passed a parked pickup truck. I didn't disturb the occupants of either the tent or the truck. Maybe it was just projection, but I had a strong sense that they had come here for the same reasons as me, and didn't wish for my company. As the trail continued west, I entered an area of steeper sandy hills. The trail always went directly up, over, and straight down the back of each hill -- I never met a hill that the trail didn't attack head-on. I was huffing and puffing by the time another familiar problem showed up: The trail fell off the cliff again. By this time, I'd climbed high above the lake and there was no way to (safely) scramble down to the beach -- so bushwhacking was the only option. This area had suffered a huge number of blowdowns that had fallen, criss-crossing each other, all throughout the forest floor. They made my bushwhacking experience even more of an adventure and slowed me down enormously. With 9+ miles on my legs by this point, I wasn't quite so spry any more. As I was bushwhacking along the edge of the bluff, miles from anywhere, I looked down to the beach and saw... another person. Let's say that this person did not, at a glance (and then a double-take), look like someone who could have easily hiked miles along the beach to reach this point. Nonetheless, whoever it was was nonchalantly picking stones and driftwood and didn't seem to have a care in the world. The surf and wind made it impossible to shout anything down at them, so I simply rested and watched for a few minutes, until I was convinced that they didn't obviously need any immediate help. Once I'd caught my breath, I continued on my way. After a seemingly endless series of hills, bushwhacking, and blowdown-scrambling, I reached the top of a particularly big hill. Or, almost the top -- I noticed that the actual top was right at the edge of the lakeshore bluff, high above the water. It was about time for another break, so I bushwhacked my way up to the edge, found a fallen tree to sit on (I had my choice of dozens), and plopped down to enjoy a break. "OK already", you might say, "Haven't you told us enough stories about taking breaks by beautiful Lake Superior beaches?" I hear you. And I ignore you. The day was amazing. I couldn't get enough of the beautiful scenery, and I was loving every moment of it -- even the really tiring moments, which were starting to pile up about now. This particular break lasted a bit longer than usual, and I even pondered laying back in the sun for a nap -- but I knew that a nap could easily end up turning into an extra night in the woods if I wasn't careful. Instead, I pushed on. The hills kept coming, and they only got bigger. The trail started to dance inland every now and then, mainly (so it seemed) so that it could climb directly up (and back down) only the biggest hills. The woods darkened under mature pines that completely shaded out the understory. The trail made another zig zag maneuver and headed straight towards the lake again, briefly disappearing over the edge of another high bluff and quickly reappearing to the west at an informal campsite situated directly at the end of a 2-track. From my map, I knew that this would be my last view of the lake before the trail headed sharply inland on its march towards my last pickup point. So, I sat down on a log for one last rest-and-gorp break before the final sprint. As I looked out over the lake, I felt a mighty longing for my "old days" of living in the Keweenaw, when I could find views like this any afternoon that I wanted them. Reluctantly, I tore myself away from the lake, re-shouldered my pack, and headed inland. The trail climbed many more hills -- straight up and over, as always -- and crossed a veritable maze of criss-crossing 2-tracks, mostly abandoned and starting to grow over. 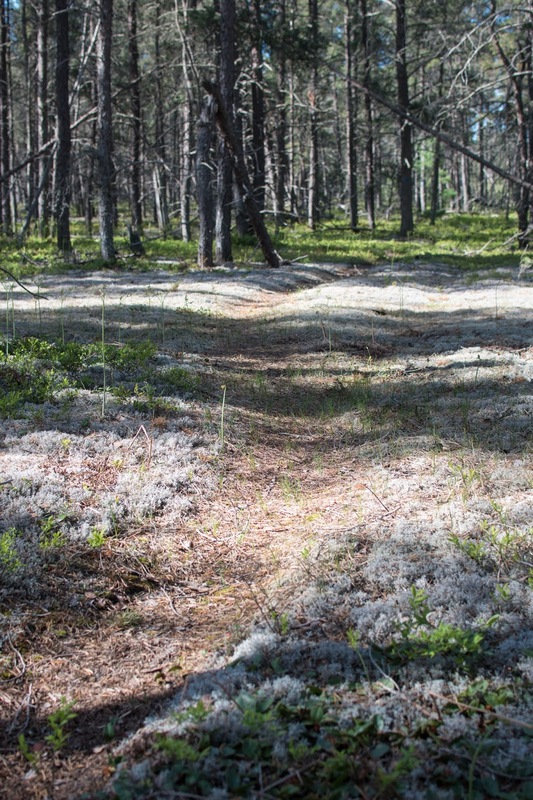 The dominant form of life in the understory was a fluffy blue-green lichen that covered the forest floor in giant swaths. The lichen was surprisingly lovely, and also dry and crunchy under my feet. By this point, my legs were just about ready to fall off. Just when I needed a change to distract me, the trail started to get greener and grassier. In short order I was marching alongside the Sucker River, the 3rd of the Suckers, although this one flows west into Grand Marais and doesn't connect with the other two. I started to see signs of more frequent human visitors in this area. The clearest sign was the amount of trash. Small and large piles littered the grassy areas around the trail, a sad but not unusual situation in the UP's backcountry. Another odd feature of the river area were a large number of white mesh cylinders. They were lying scattered around on the ground, and initially I wrote them off as more garbage. 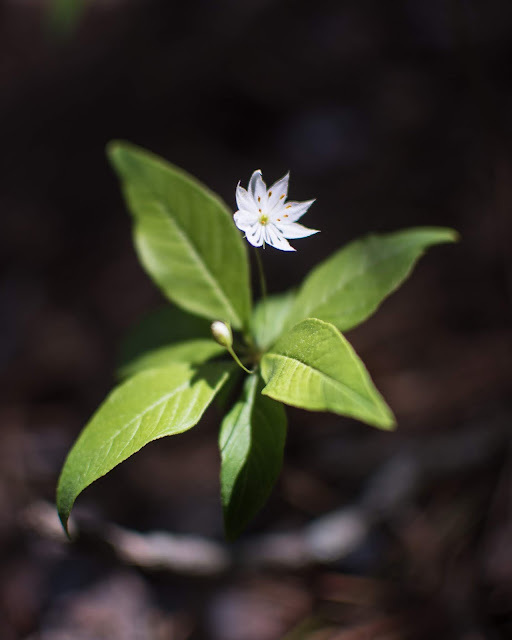 But then I started to see them standing upright -- with tiny saplings growing out of them. Not inside them, like a grow tube or trunk protector, but almost always growing out through the mesh. 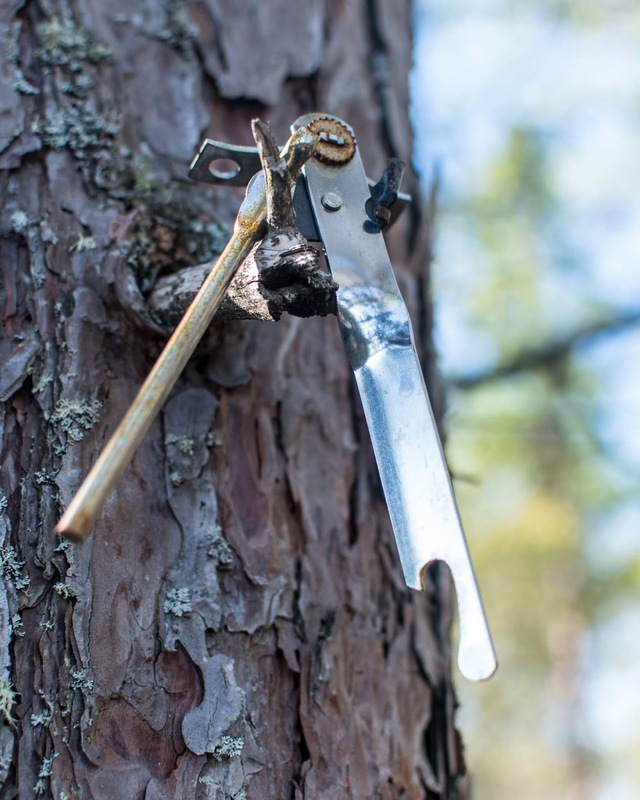 I eventually decided that these were intended to protect saplings from animals, but they had not been tended well and were more likely choking off the tree growth instead. The trail followed a sandy 2-track along the river, which gradually became a narrow dirt road, and eventually a wider gravel road. 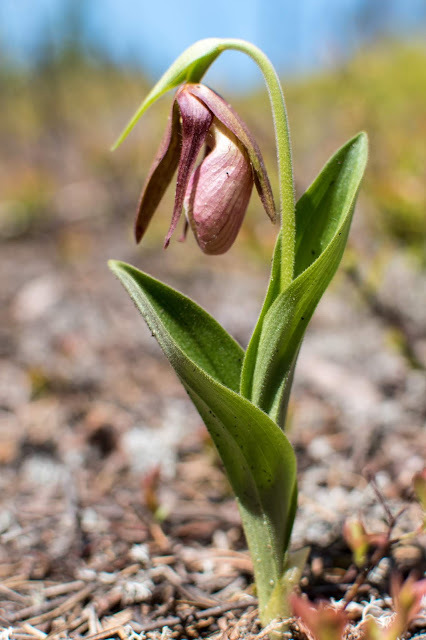 I suddenly popped out at a paved road intersection -- School Forest Road, with a sign detailing the conservation efforts of the Grand Marais school students. 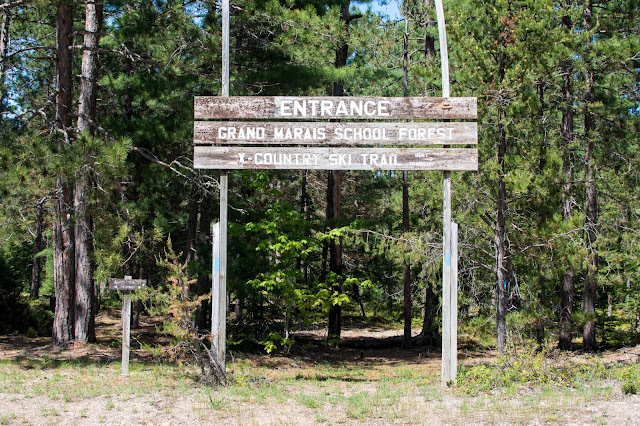 The trail crossed the river by following the road, then jumped across the road into the Grand Marais School Forest. The NCT followed ski trails through the forest, which seemed to stretch on for days. My legs were made of lead by this time, and I wasn't so much enjoying the hike as merely trudging forward like an automaton. After an eternity -- but probably more like 30 minutes -- the trail brought me to a large sign advertising the cross country ski trails. On the other side of the sign was... the Grand Marais Truck Trail! This was the 3rd time I'd met it today, although here (much closer to Grand Marais) it was paved and named "Grand Marais Road". This was the last of my possible pick-up points. I very briefly thought about continuing 2 miles west into Grand Marais, but whatever part of my brain had that thought was shouted down by my legs, shoulders, and everything else. I was not about to push it any farther. The finish line! 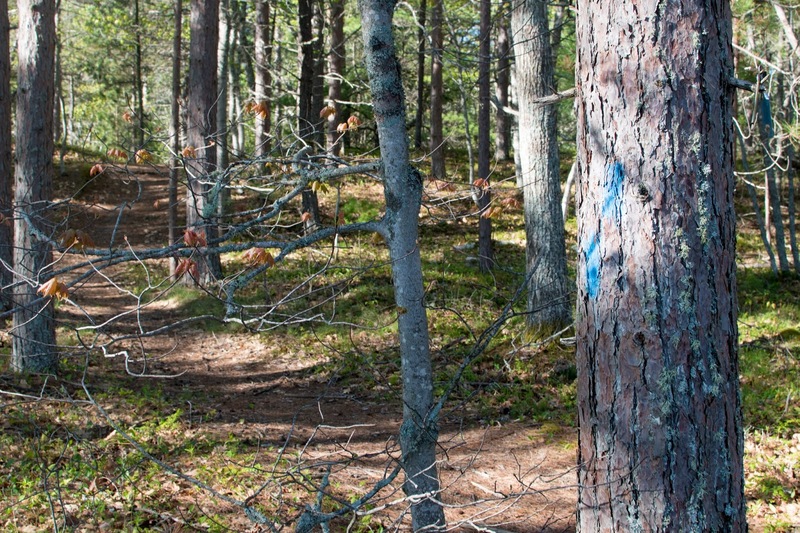 Blue blazes visible on the posts. Amazingly, despite being the main trailhead for a big ski trail system, there was no bench anywhere to sit on. Instead I dropped my pack and plopped down with my back against a comfortable looking tree. I almost immediately had to put on my bug-proof headnet. But otherwise, with a bag of gorp next to me and my Kindle in my hand, nothing was going to get me to stand up for a long, long time. About 30 minutes later, Sarah and her parents cruised by, looking for me. I jumped in to their truck (well, crawled in slowly) and was overjoyed to find that they'd already found and picked up the bags that I'd left at the previous trailhead. We drove the last few miles into Grand Marais, cruised around town briefly, and then headed south to the Cobblestone Bar in McMillan. A burger and fries had never tasted so good... at least since my last backpacking trip. Reflection. My final tally for the day was a whopping 13 miles. That might not sound like a lot to some of you, but for me it was a personal record -- one more mile than even our epic march from Moskey Basin to Rock Harbor during our first Isle Royale visit. For the whole trip, I'd done 20 miles in two days, a wholly respectable tally. But it really isn't about the numbers. This segment of the North Country Trail was every bit as lovely as I'd hoped. Despite the frequent trouble with the trail disappearing right off of a cliff, it was a (mostly) good trail through (very) beautiful country. The nearly constant views of the lake were a big plus, as was the extreme solitude. West from my endpoint, the trail enters Grand Marais, a tiny town that is also at the east end of the Pictured Rocks. 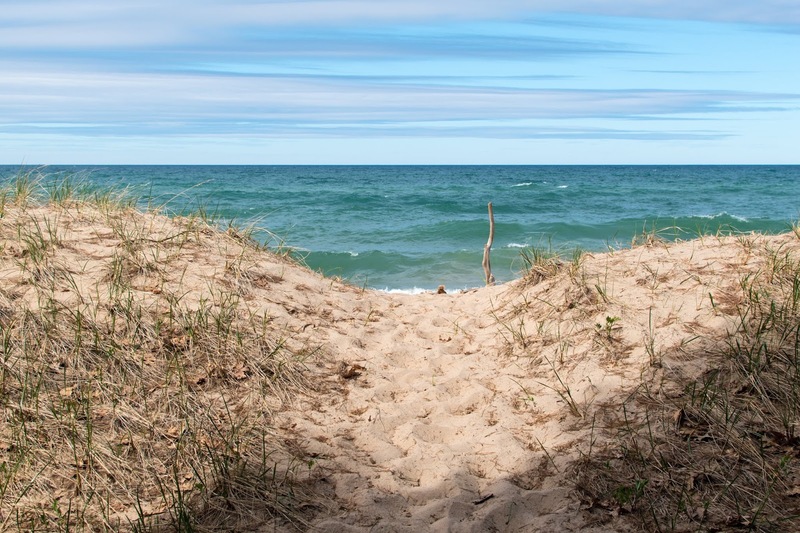 From Grand Maris the trail winds through Pictured Rocks and is much, much less quiet. East from my starting point (Muskallonge State Park), the trail does a series of odd zig-zag maneuvers to avoid private land along the lake, and then heads directly inland towards Tahquamenon Falls. I was glad that I hiked the trail in early June, and a cold early June at that. 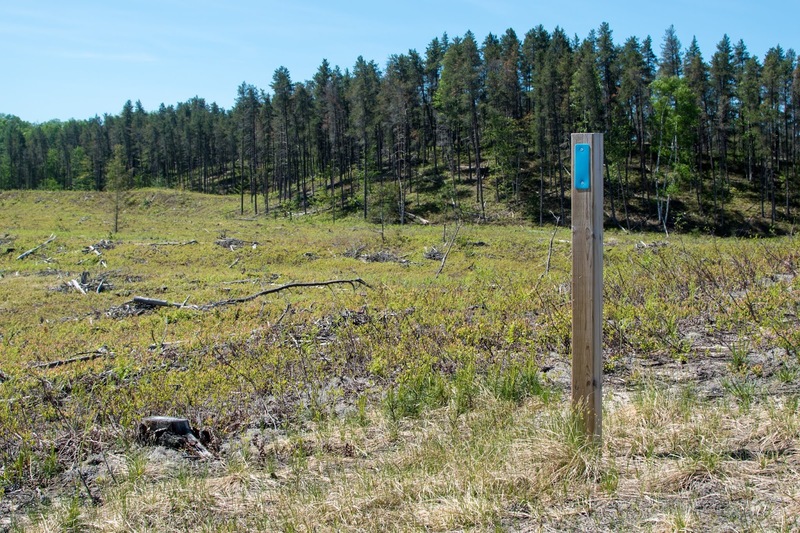 Much of the trail would be swarming with mosquitoes and black flies just a few weeks later. The rivers and swamps along the way would only have made that worse. In the end, I'm glad I did it -- and I'll be making my way back again as soon as I can. Today's trail map, with Grand Marais Truck Trail crossings visible along the way. The dashed green line is the Blind Sucker Pathway. I was eagerly awaiting the latest installment. I am somehat familiar with this area but have never hiked it. Seems like it presents different kinds of challenges than Isle Royale or the Porkies. Thank you for posting. I really enjoyed reading it. Jim, glad you liked it! It was a new experience for me to backpack through here. Like I said, I wouldn't go during bug season -- that end of the UP is *swampy*. I was waiting and watching for your next installment! Really enjoyed it. Grand Marais is a cool little town with an amazing beach and one of the very best fresh whitefish restaurants in the UP. We are heading over the bridge next week to visit my son at MTU, he of the Isle Royale senior hiking trip. As busy as he has been in his first term there he has taken the opportunity to do some exploring. He truly loves it up there. Glad to hear it. Tech (and the Keweenaw) are a special place. Not everyone loves them, but when you do... it really gets into your blood! We had a great trip! Despite way too much rain on the drive up, which turned to SNOW west of Marquette😡 the colors were stunning, probably at peak! We attended the hockey game on Friday after waking up to SNOW on the car that morning and drove the Keewenau on Saturday before attending the alumni orchestra concert later that evening. The more we get to know the Keewenau and Houghton the more we like it.